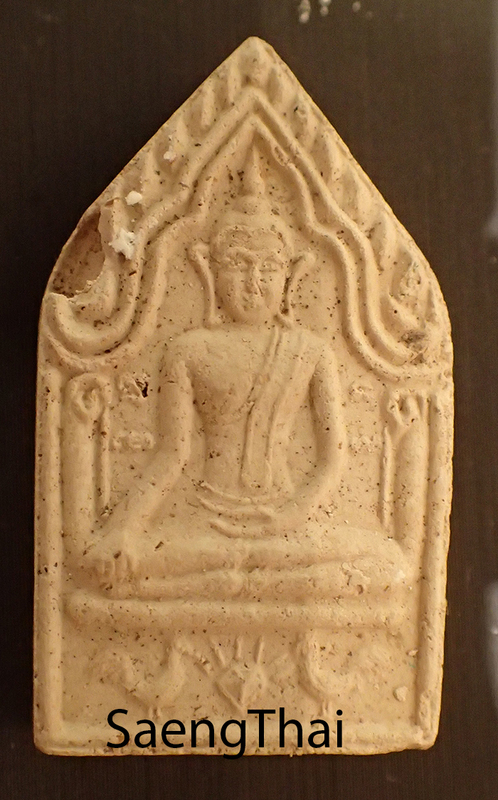 This Phra KhunPaen PhraigumanÂ was made in the year 2537, the same year Phra Archan Somjit passed away. This KhunPaen was not much in the market because we hardly give them up. 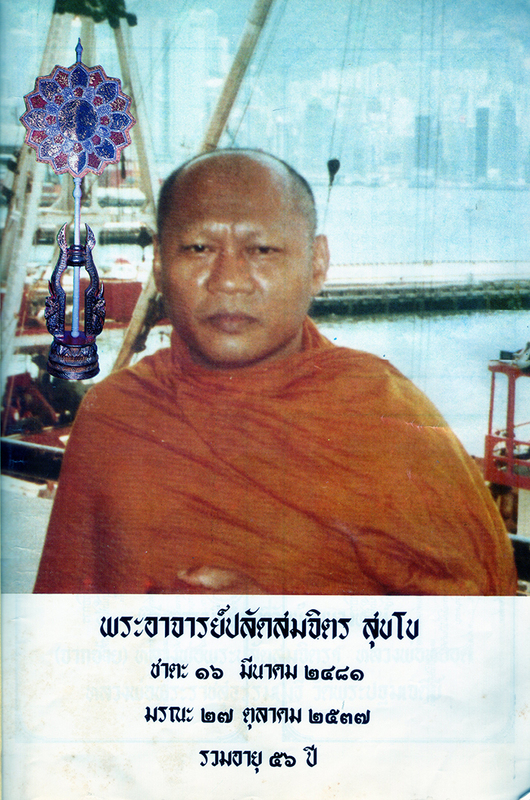 Phra Archan Somjit was our very early teacher we waikhru with. We had a lot of our Phra Archan’s collections. Even those Phra Archan’ s buchasÂ revered in his kuti is in our library. We don’t really promote because Phra Archan ploksek this batch of Phra KhunPaen for a long time before Phra Archan gave it to us. My teacher only gave them to our members. For those who doesn’t know Phra Archan very well, a lot of his collections are very popular, eg Phra Sivali, Phra Somdej, GumanThong, BuchaÂ Phra Narai Phra Petchalukan, Takrut Phra Petchalukan and InnThong just to name a few. 1. Khun means The bearer of this amulet will raise to great heights, popular, attractiveness,Â important, powerful, authoritative and victorious. 2. Paen means The bearer has well life planning and have great ability to formulate, strategize and execute his plans well both in personal life and inÂ career or business. 3. Rooster means The bearer will be hardworking and productive.Â Good punctuality and early riser. Â A person whom can execute and works his plans well until attains success and wealth. Will rise to great heights. 5. Phraiguman riding on horse;Â In Thai Language, theÂ word Phrai have double meaning it either means evillish spirit or brilliant. This KP is made with good pong Putthakoon. Especially Pong Phra Somdej Wat Rakang which Phra Archan showed us. And many other good powder. So here, Phraiguman mean the brilliant child that carries the barami of The Triple Gems and Kruba Archans.Â Plus the ittirit or power of the Legendary KhunPaen’s son that brings success and victories to KhunPaen himself. The back of the amulet depicts the Guman riding on a horse, it means success in all undertakings with lucky windfalls and sudden gains. 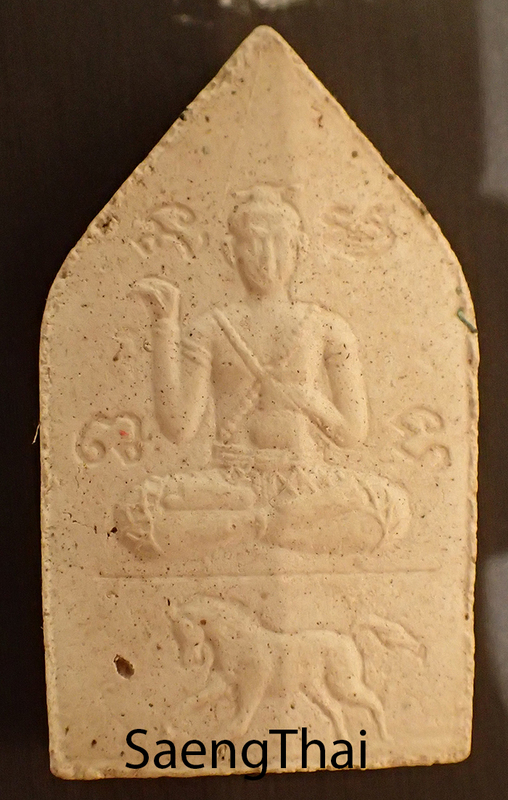 Phra Archan advised that this amulet should be carried regularly on the bearer or put in a suitable place at home or business place because it will bring the bearer or his home or business auspiciousness. This amulet is rather small about 0.75 inches by 1.5 inches. 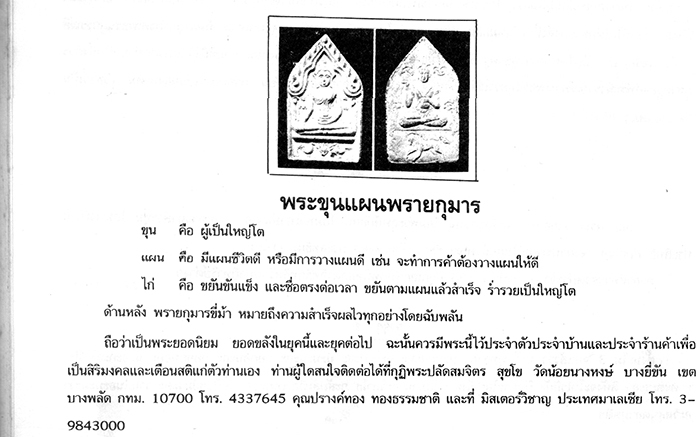 For those whom can read Thai, it is specifically mentioned that those whom are interested can either contact Phra Archan Somjit himself or SaengThai in Malaysia. 15th Jul 2015, Thank you for my readers or followers from Singapore and their feedback. Some enquired why their KhunPaen phim pong (powder) Â color is different. Phra Archan Somjit did make a normal batch where the pong color is more whitish at the same time. The only different is, according to Phra Archan Somjit, the ones he made for us consist of Pong Wat Rakang, Pong Wat Paknam and Pong Wat Plab.